There are many kinds of cherry blossom tours available. 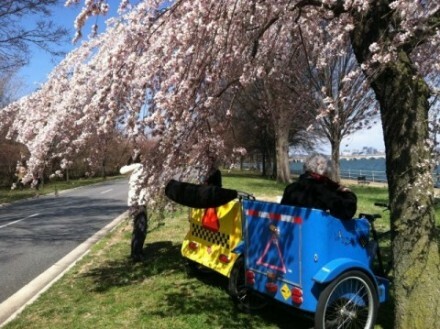 But the best way to visit the Cherry Blossoms is to go on a pedicab tour. 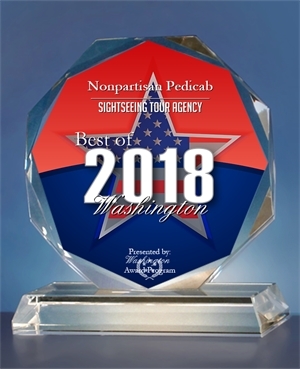 Nonpartisan Pedicab offers tours of the National Mall and the monuments and memorials. 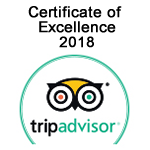 We can take you around the Tidal Basin to see the Cherry Blossoms surrounding the Jefferson Memorial, the FDR Memorial and the MLK Memorial. 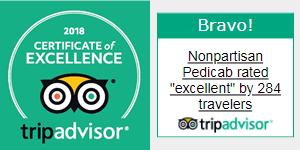 We can also take you down to Haines Point to see even more cherry blossoms. The trees blossom in late March or early April depending on various factors such as the temperatures and precipitation of the winter. The trees are in pre-bloom for a couple of days. Then, they go into full bloom for just a few days. There are a few stands of a more hardy variety of blossom that last for as long as two weeks. Hopefully, your trip will occur when the trees are in full bloom. The largest grouping of cherry trees is around the Tidal Basin. This is also where you will find several major monuments such as the Thomas Jefferson Memorial, the Franklin D. Roosevelt Memorial, and the Martin Luther King, Jr. Memorial. On Nonpartisan Pedicab cherry blossom tours you will get a chance to stop at each of these monuments and walk in to look around and take pictures. The cherry blossoms will be celebrating 103 years in 2015. The original cherry trees were a gift from Japan. The first lady of the United States, First Lady Helen Herron Taft and Viscountess Chinda, wife of the Japanese ambassador, planted the first two of these trees on the north bank of the Tidal Basin in West Potomac Park. At the end of the ceremony, the First Lady presented Viscountess Chinda with a bouquet of ‘American Beauty’ roses. These two trees still stand at the terminus of 17th Street Southwest, marked by a large plaque. By 1915, the United States government had responded with a gift of flowering dogwood trees to the people of Japan. On December 11, 1941, four trees were cut down. It is suspected that this was retaliation for the attack on Pearl Harbor by the Empire of Japanfour days earlier, though this was never confirmed. In hopes of dissuading people from further attacks upon the trees during the war, they were referred to as “Oriental” flowering cherry trees for the war’s duration. Suspended during World War II, the festival resumed in 1947 with the support of the Washington, D.C., Board of Trade and the D.C. Commissioners. In 1994, the Festival was expanded to two weeks to accommodate the many activities that happen during the trees’ blooming. Two years later, the Potomac and Arakawa became sister rivers. Cuttings were taken from the documented 1912 trees in 1997 to be used in replacement plantings and thus preserve the genetic heritage of the grove. In 1999, fifty trees of the Usuzumi variety from Motosu, Gifu, were planted in West Potomac Park. According to legend, these trees were first planted by Emperor Keitai in the 6th century and were designated a National Treasure of Japan in 1922. From 2002 to 2006, 400 trees propagated from the surviving 1912 trees were planted to ensure the genetic heritage of the original donation is maintained.